Without social media marketing, no startup company or small business will succeed. Small business, freelancers, bloggers and marketing professionals are always looking for marketing tricks to ease up on their marketing life. So for those of you looking to boost their social marketing with simple tricks, I’m creating such lists. I recently curated this list from my daily marketing newsletter called – “Marketing Idea A Day”. All tricks listed here are only summaries. Your social media marketing efforts had drawn traffic to your website – now removing friction on your website homepage can – and will – result in more signups for the service you provide. This is extremely relevant for the SaaS / software / service industry, where you want to grab the users email and let them experience the service / value you offer as quickly as possible. You already invested time and money into some of your best materials such as an online course, webinar, podcast, video, large post etc. It’s the recycling era, so why not reuse them again? Here are a few examples: Tweet sentences with a link back to your post, turn a long post into a video tutorial, turn your long post into an online course, create a podcast, create infographics, create a SlideShare. Take a long post in which you’ve already invested the time and effort and take it apart into smaller pieces of content: 10 smaller posts and publish them on your social networks, tweet 100 sentences with a link back to your post, assign an image to each small post and publish to Pinterest. Haven’t used Facebook Lookalike Audiences yet? Facebook: “Lookalike Audiences help you reach people who are similar to your current customers for fan acquisition, website registration, off-Facebook purchases, coupon claims and brand awareness.” Use it to find similar people to those you uploaded in your Custom Audiences and target them. This is social media marketing at it’s best. Are you familiar with Viralwoot? Well, it can make your Pinterest experience easier. Viralwoot is a free / premium tool for gaining followers to your Pinterest account. It’s quick and easy and you will see the results very quickly. 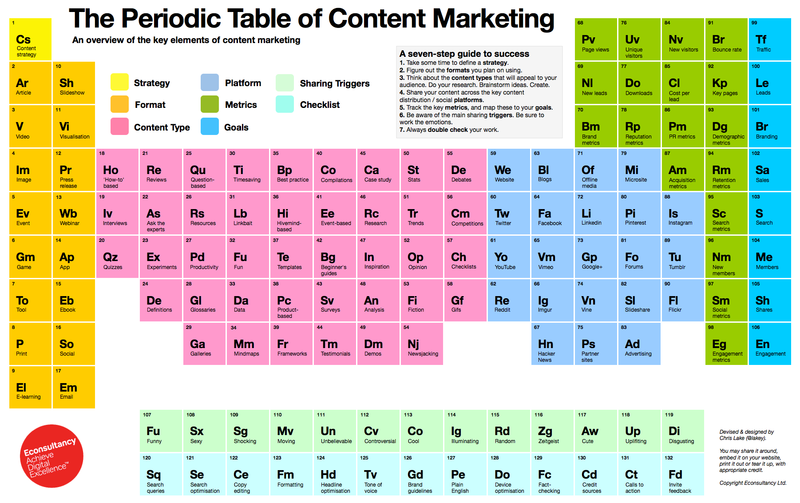 Back in March 2014, Chris Lake created a very useful content marketing periodic table to summarize all possible aspects of online content. I find it helpful, so I am bringing it back for another digital viral spin. Triberr is a option for social media marketing. Create a tribe, connect your blog’s RSS, post at least 2-3 times a week, comment on fellow Triberr bloggers posts, check out the “bonfires” section where you can find bloggers eager for attention, share other bloggers posts, share your Triberr posts to your social networks because Triberr’s are hanging out there and will spot your activity, which in turn will result in them following your Triberr profile. Spoiler: only for iPad / iPhone users (sorry Androids!). Although they are real followers, as mentioned before, they are basically not filtered and of low quality. But hey, you are also there – so maybe the quality is not that bad? LION – Not the African predator, but the acronym for LinkedIn Open Networkers. LION’s are Linkedin members looking for business opportunities all over the world, therefore they want to connect with people they don’t know, like you. When you send them invitations they will approve it and so you will not get IDK penalty points (that’s when people tag your connection request as “I Don’t Know this person”). The main thing here is that they publish their Linkedin email addresses to be found and connected. Join LION Linkedin groups to find more connections. LinkedIn is the best social media marketing place for high end paying customers. This is one simple and useful method I’ve been using for a long time now for finding active Twitter users who follow back. Find a Twitter profile by searching a keyword in the search box (or any other method you know), verify the profile has at least 1,000 followers with a following / followers’ ratio of ~1.0 and follow their followings. They are the one who follow back. Spoiler: These types of profile are called ‘Connectors’ and they are from a midrange quality to send them your tweets since they follow many people. Social media marketing is 10% creating and 90% promoting. “This sentence has five words. Here are five more words. Five-word sentences are fine. But several together become monotonous. Listen to what is happening. The writing is getting boring. The sound of it drones. It’s like a stuck record. The ear demands some variety. Now listen. I vary the sentence length, and I create music. Music. The writing sings. It has a pleasant rhythm, a lilt, a harmony. I use short sentences. And I use sentences of medium length. And sometimes when I am certain the reader is rested, I will engage him with a sentence of considerable length, a sentence that burns with energy and builds with all the impetus of a crescendo, the roll of the drums, the crash of the cymbals –sounds that say listen to this, it is important. Your social media marketing content dies after a while, so it’s a good practice to know when is the best time to post in order to maximize exposure. This also changes from one platform to another. Attach an image to your tweet you will get a shocking 150% more retweets, 89% more likes and 18% more clicks. But the images should well fit with the text and links. Add a link to a tweet and it will get 25% more clicks. Blab is the new kid in the video streaming for social media marketing in 2016. Log in with your Twitter account, you can leverage your visibility very quickly. A great way to be noticed among professional Twitter’s is the Twitter Chat. A Twitter Chat is an online networking event where a group of Twitters “meet” at a pre-determined time, discussing a specific topic, using a hashtag (#) in their tweets. Since these chats can be very fast paced, you can try using some online tools to help you control the chat space, such as Tweetdeck. A Twitter Chat is an online networking event where a group of Twitters “meet” at a pre-determined time, discussing a specific topic, using a hashtag (#) in their tweets. After getting some experience participating in chats, consider creating your own Twitter Chat. Go to http://twubs.com and register your Twitter Chat unique hashtag. It’s not a must, but it will help you get more exposure. Make the hashtag short and clear. Want to double your posts engagement by 200%? On every platform you use, you should always take the time to create the best profile page for yourself or brand. A good profile page increases credibility and also helps out on SEO when search engines understand your brand better. Having a good looking profile page cannot be over emphasized. The exact best time to post on social networks during weekdays changes from one platform to another and for each industry or niche. Find the best times to promote your business. Studies consistently show that users with a lot of posts have a lot of followers. This doesn’t come as a surprise since posting create exposure. Posts / Tweet / Pin as much as you can and use automated systems for this. This is a sure way to get a lot of followers on Twitter, Facebook, Pinterest and even LinkedIn. Managing a Facebook group will get you a lot of connections and publicity in your industry. Tell people why you created the group – do it in the welcome message. By using Scoop.it or paper.li you can simple bookmark favorite content you bump into, quickly create beautiful magazines out of it and also suggest automatic content. Scoop.it also allows you to send it as a beautiful newsletter. Awesome social media marketing niche. Hashtags are one of the most important features you can, should and must use to increase your visibility. They make your post appear in search results and this is extremely important. Hashtags are super important in social media marketing. You should really know your hashtags. Getting your hands on good mailing lists can be great, not for spamming, but for importing them to Twitter, Facebook, LinkedIn and AdWords for audience targeting and other exploits. Go to http://lists.nextmark.com, filter your niche, sort it by rank and buy your mailing list. There are also great browser add-ons to help you here. Video explainers are very viral, easy to create and can get you a nice amount of traffic. Find an interesting piece of content on a relevant website. Verify the content has been shared and linked a lot. Inform relevant people who linked or shared the “original” content, about your content. They will most likely link and share your content as well. Do you have posts on your blog? You already took the time and effort to create them, so why not reuse them again as a webinar, SlideShare, infographic, drip emails, YouTube videos. One of the best email spam workarounds in social media marketing is the in-mail and messaging services. This allows you to contact target audience directly and personally. However, exploiting this in a “spamy” way will get your account banned very quickly. You have to be honest and real. When Instagram posts are tagged with location they get 79% more engagement. If this feature is relevant to you or your service, then turn it on, since it is turned off by default. Mention someone using @ in your post caption to get 56% more engagement but be careful – be authentic and relevant and don’t over use this trick because you can get your account deactivated. People remember what they read at the beginning or at the end but almost never what they read in the middle – so put your strongest message at the start and at the end. Make a post presenting a list of sources, bloggers, influencers, techniques or whatever you feel like that is really useful. For each item in the list you could add a link to the source website and add the author name and even twitter handle (@name). Name it “The Top 100…” or whatever. Now, tell the people you’re linking to about it. It’s no secret that tweets with images attract much more engagement them text only. Though it’s not always so easy for us users to upload images. Using TwitShot makes things so much easier for your social media marketing . When people search for a keyword on search engine and encounter the same keyword on the page, chances are higher for them to take action. Use your search console to find your most organically visited pages and embed lead magnet with the keyword that brought people in. Your page total social shares can be summed up and displayed as one large number instead of displaying each social platform single count. You can easily do it using: https://wordpress.org/plugins/addthis and alike. Setting multiple CTA’s around your sites will increase conversions. It can be a button, an email textbox or a downloadable freebie – whatever, just put them everywhere so your user will not have to stop and think even for a second where to sign-up. Everyone has their own favorite social platform. It could be Facebook, Twitter, Linkedin or Google+. Create the same group with the same name on each social platform. You can even import your existing connections from one platform to another and invite them again. Post the same information you post on your Facebook group to all other groups. Don’t worry about your members seeing the same info again and again on different platforms, because they won’t. Most of us use only one favorite social platform when consuming daily information. Create your special secret closed group on Telegram, Whatsapp’s little brother for instant messaging. As of November 2015, Telegram groups can contain up to 1,000 users with an admin manager while Whatsapp is still limited to 100 users. Stop saying thank you on social media and start saying something meaningful! Take 5-10 posts which you’ve already invested time and effort into, and combine them together into a nice looking PDF guide / collection and offer it as a signup gift. Whoever signs up on your website will get to download the PDF. Offer an informational resource in exchange for a users’ contact information. Free webinar is a great way to funnel new customers to your payed product or service. The webinar is a great stage to impress people and invite them to buy something. We are information aggregators crazy about collecting and downloading information – only not to read it again. Turn this disadvantage in to your advantage and turn your best website posts into a PDF and offer them as downloadable paid by the user email address. Offer coupon code in exchange for the visitor’s email address. The coupons can be discounts for other sites or to products you sell on your site. Catch your users’ attention as they try to navigate away from your site by moving their mouse towards the back / home button, displaying a popup. Offer your visitors two options in your signup buttons form: “Yes – I want huge traffic to my website!”, “No, I don’t want more traffic…”. This little tweak is proven to be surprisingly effective and will deliver more ‘Yes’ conversions than ‘No’ since people tend not to agree with the ‘No’ statement. Send a follow up email containing tutorial. Give your subscribers something for free to gain trust and show it is worth staying signed up for your newsletter. Send a follow up email containing aspirational content. Either test cases where other customers succeeded above and beyond with your product, or stories you can tell to ignite people emotions. When sending email containing transactional content such as updates, messages, invoices – with proper adjustments they can serve as nice growth engines, just give something extra. Don’t include a call-to-action in every marketing email you send. Instead, add a “Read the rest of this…” linking to the website post. This is gentle CTA. Sending your users a 1-3 short emails containing a simple message with no CTA can be seen as more personal and refreshing. Of course these sorts of emails should come as a buildup for a CTA email following them. Filling up missing information about your existing email list can help you to know your users better, hence better understanding of what will pull them back to your site and perform a purchase. Use tools like http://rapportive.com and http://www.zoominfo.com. Mailchimp researchers studied approximately 24 billion emails subject lines, composed of 22,000 distinct words. They filtered out the following words as critical ones when measuring email open rates. These words will cause an increase in open rate when used in the email title: Urgent, Breaking, Thank You, Important, Announcement, Invitation / Invited, Freebie, First & last name, Announcing, Alert. Mailchimp researchers studied approximately 24 billion emails subject lines, composed of 22,000 distinct words. They filtered out the following words as critical ones when measuring email open rates. These words will cause a decrease in open rate when used in the email title: Donate, Last Chance, Cancelled, Reminder, Charity. Instead of saying: “I will be happy to assist you if you need any help.” ask: “How can I help you?” – this is a call for action and will motivate for an answer. Offer your email subscribers or social media followers coupons for “saving money / deal / discount” to send them to your site from forums and coupon sites such as http://hip2save.com/ , http://www.coupons.com/ , http://www.groupon.com/ and more. Instead of sending regular blog newsletter containing your recent posts, links and information, try focusing it on specific subjects building a call to action funnel. For your social media marketing efforts not going to waste, drip email course is a great and easy way to get people back to your site. Drip email courses are a great way to get people back to your site, getting more leads and up-selling, but a video drip email course is even better, especially for up-selling. Entry surveys are a great way to get to know your audience and learn why they signed up, where they came from and what they want to accomplish. Do it the moment after they signed up. When opting-out, ask the users a question with several answers to choose from and allow them to elaborate where needed. This is a must for better understanding the reason for churn. When users request opting-out or closing an account you can offer them an alternative. Try encouraging your followers on Monday morning with something funny, positive, energetic, inspirational, quotes etc. Nothing of a marketing kind. Let them start the week first. A great social media marketing trick. Encourage your users to be active and they will spread the word for you, promoting themselves and you. Do it through contests, user-made videos, user product design suggestions, etc. Ask the readers to comment below. The commenting platform – Facebook, LinkedIn, Disqus and even WordPress, informs the commenting users about any activity on the page, drawing them back to the post. Personalization, which was originally intended to grab our attention, is now so overused that it has actually become a marketing flag. If you got something really important to say to your subscribers, start the email subject line with “Fwd:” or “Re:” and your open rates will sky high. Target your dormant subscribers on social platform using retargeting. Group Direct Messages is sending 20 people on Twitter an existing tweet or new message with text, links, images and emoji. Twitter limit (as of 2015) is up to 20 of your followers. Since Twitter tweets lifespan are extremely short, around 10-20 minutes, its good practice to send your tweets when others are listening. Use Tweriod to do that. Go to your Facebook page > Insights > Posts > check out “When your fans are online” tab to view the exact days and hours. It makes sense to post when they are active. Hide parts of your post content or some downloadable stuff you created, asking people to share to socials in order to unlock it. Use http://bizpanda.com for this. As in hiding the content of a post trick, you can do the same and offer some kind of a discount or coupon behind a share to unlock. Google for “share to unlock plugin” to find suitable plugins. Let bloggers use your service for free and they can funnel back a ton of fresh traffic to your site. Google: “free for bloggers”. When done correctly this can be the main growth engine of your business. Ask for referrals and even offer referring users an incentive. Make it super easy to refer – one click. Great one for the social media marketing arena. When visitors become subscribers by giving you their email addresses, they are in a great state to recommend you to others. Throw in a little thank-you downloadable gift for sharing and you got yourself some nice virality going. Make it more attractive for your visitors to share your content by displaying only the networks they are using. You can use AddThis dynamic social share bar which is known to identify only the social networks the visitor is using, displaying only them to the user. Email forwards have significant meaning – they are an indication of your email program’s health. It’s a sign that subscribers are more than satisfied. Ask people to sign up to your email list. Send them free helpful content. Send them more free helpful content. Ask them to buy your product. A common method for eBook Kindle marketers on Amazon is to drop off the price of their Kindle book to $0.00 for a few days every month, which allows them to gain more exposure and reviews. Inform your subscribers and followers and ask them for a (good) review. To preserve paying customers and reduce churn narrow down new customer targeting. Lower the price in 1 cent just enough to change the left side digit: $5.00 will become $4.99. Placing the dollar sign next to the 4 instead of the 5 will subconsciously influence us. $10 will convert better than $9.67 and even better than $10.00. According to Janiszewski & Uy (and common sense), when presented with round prices (e.g. $10), people doubt the price because it seems more artificial and without true rationality. $25.40 will convert better than $25 and even better than $25.00. Prefer pricing at $36.15 (5 syllables) over $37.85 (7 syllables). After a few freebies you give to your subscribers such as PDF guides, cheat-sheets, checklists etc, users are more ready for purchase because they feel they know you. Contact a Facebook / LinkedIn group manager and offer an exclusive proposal to the members of their group. If your post will be pinned by the manager, then expect TON of traffic and sales. Groups should be your best social media marketing channel. 100 Detailed pages containing All tips & tricks with full details!